Below you will find information and products that the professionals have found to be valuable when RVing. The products below will help protect your RV and make for a better camping experience. Here is one product that is of vital importance when hooking-up your RV to the electrical box in the RV park. Many RV parks are inconsistantly wired and you can almost be assured of spikes and surges while hooked up, which can burn out appliances in your RV, causing costly damage and ruining your trip. Indicators on the surge protector will warn you if there is a problem with the RV electrical box. This surge protector is for 50 amp Fifth Wheels. Tip: Plug the surge protector into the sites electrical box before you setup in the site. If there is a problem with the electrical box, the surge protector will warn you, saving you wasted time having to move to another site after setting up your rig. Adapter 15 amp male to 30 amp female. 50 amp to 30 amp Dog Bone Adapter. Definately a must-have if you have a 30 amp RV. This allows you to plug your 30 amp RV electrical cable into a 50 amp RV site electric. There will come the day when there are no 30 amp sites available and you will be prepared for a 50 amp site. The dog bone adapter safely supplies the RV with 30 amp service although it is plugged into a 50 amp supply. A must-have for safety. 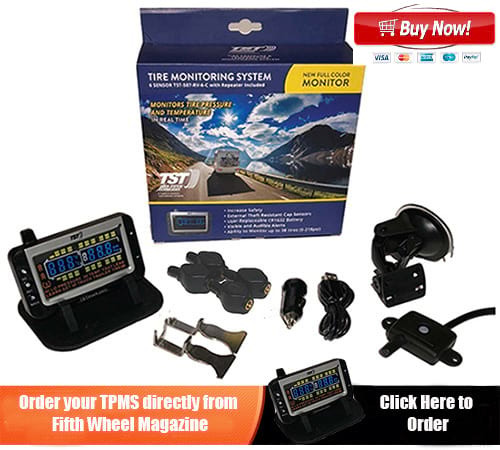 The TPMS system monitors both tire pressure and temperature and alerts you to any problems with a tire. The system can monitor up to 22 wheels. Easy setup. Simply hold the monitor to the sensor and the sensor unique Id code is recorded for each wheel. Most tire failures have increased temperature and this monitors both. To check all of your tire pressures before a trip, simply turn on the unit and it will show all tire pressures. This saves having to check every wheels pressure manually. Nearly all tire failures are due to incorrectly inflated tires. These are great when backing into a site. Someone at the rear of the fifth wheel can guide you in using the two-way radio. They are also useful if you have a second vehicle that follows the Fifth Wheel. As we all know - cell phones suddenly get spotty reception out in the wilderness when you really need them. Applies opposing force to tandem tires so that your fifth wheel does not move around when people are in the camper. We cannot emphasize enough the need to have at least two or more fire extinguishers in your fifth wheel. Class A fires are ordinary combustibles such as paper, wood, cloth, fiberglass, tires, 12-volt. Class B fires include flammable liquids such as gas, propane, oil, oil based paint. Over 80% of RV fires are Class A fires. Make sure your fire extinguishers are A/B extinguishers which can put out both Class A & B fires or are rated as "All Fire". A good quality sewer hose will save you alot of frustration and messy accidents. 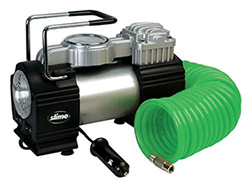 A RhinoFlex sewer hose kit is one of the best, and is tough and reliable. TIP: Purchase multiple lengths to join together and you will never have the problem of to short a sewer hose in the campgound. TIP - Always dump the blackwater tank first and then the grey water (shower and sinks water). This way the grey water tanks will clean out any debris in the sewer hose left from the blackwater tank. Here is a tool that can be very helpful when stuck on the interstate with a flat fifth wheel or Toy Hauler tire. Simply drive the fifth wheel up onto the Trailer-Aid to lift the flat tire off the ground. Note: If your fifth wheel has an independent suspension, then there is a good chance the Trailer-Aid will not work on your unit. Your truck and Fifth Wheel tire inflation pressures are critical to the safety of your rig and to you. Most tire blowouts are cause by incorrectly inflated tires. Tire pressures should be checked before each trip, both on the fifth wheel and on the tow vehicle.